Egads! A wild Patreon appears! Or the podcast about art and storytelling that I help create and host – the Galaxy of Super Adventure! Whatever brought you here, it was probably due to something I had a hand in making, but I want to make MORE! Currently, I work three jobs, which doesn't always leave much time for creating the comics and art that I truly love. 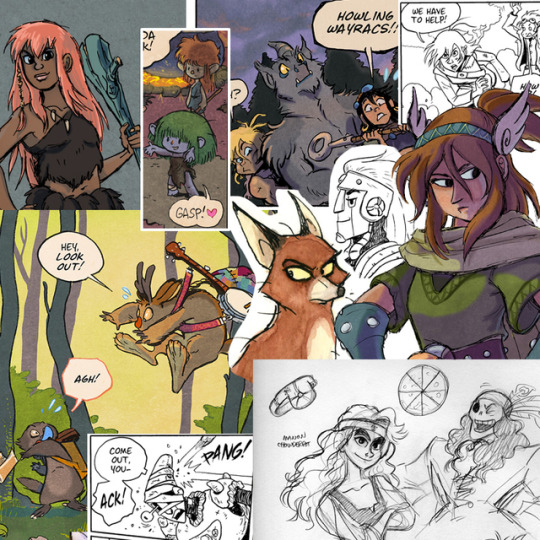 I have stories I want to tell, and projects that I want to show you, and that's why I hope you'll consider giving me a hand! The more I can earn here, the less time I'll need to devote to work that is not Making Things. And the more Things I Make, the more Things You Have to read and enjoy! Every dollar that is contributed is a step closer to producing the comics, the books, and the podcasts – like the ones that brought you here in the first place - full time! Wait, so what's the deal with you and Patreon? I know you have a lot of choices as to where your hard earned money goes, and from the bottom of my heart, THANK YOU for considering becoming a Patron. I hope we can build this Patreon together and bring as many fun stories and characters as I can muster into the world! One more time. It bears repeating: THANK YOU! (And yes, especially you). A warm, glowing feeling washes over you as your minor contribution spreads its wings and takes flight once a month to offer love and support to an artist whose work you believe in. Deep down, you know that every bit helps, and you can rest easy knowing that you've given your approval to a creator in need. Thank you! You're thinking, "I like this guy's stuff! I'd like to buy him a drink, or at least some items off the Value Menu!" Then this reward is for you! In return for your comestible generosity, you'll get exclusive access to process blogs, behind the scenes sketches, and the warm feeling of a good deed. Here, you'll get exclusive access to my PODCAST before anyone else! That's in addition to the production blogs and sketches! But wait, there's more! How about monthly access to all of my comics a full day early! You want more, you say? Fine, fine. I'll also throw in the warm, fuzzy feeling of becoming a certified Patron of the Arts! At this tier you get the exclusive process blogs! You get the podcast! You get the warm fuzzy feeling! And you also get entered in a DRAWING FOR A DRAWING! For every month that you contribute to this tier, you have the chance to be randomly selected for an 5" x 7" original piece of full color art of your choice! Plus, I'll be live streaming the actual process of creating that drawing for everyone to enjoy. Want to try for just one month? That's fine! You can change your Patreon pledge at any time. HEAR YE, HEAR YE! I love making things for your eyeballs, but I also love making things for your earballs! In addition to co-hosting the Galaxy of Super Adventure podcast, I also want to start bringing you weekly journal podcasts for your aural pleasure. At this goal, it will allow me to spend time each week recording, editing, and posting a ZackCast that you and everyone else at the Underground Rocketship Crew can enjoy!